The Women are Persons! Monument is located on the grounds of Parliament Hill in Ottawa, Ontario. 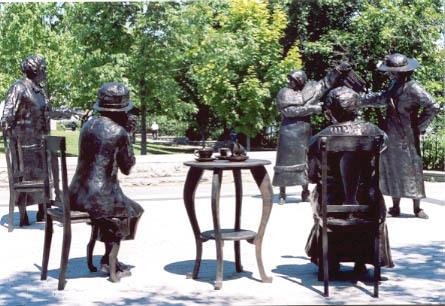 The monument was unveiled at a special event on October 18, 2000 to commemorate the Persons Case and the Famous Five women involved. Until this monument was installed on Parliment Hill, the only people honoured by statues here were dead prime ministers, monarchs and fathers of confederation. The Famous Five Foundation lobbied for about five years to have the Famous Five commemorated on the Hill.